Just a little something to let you know what is being created by mapping buildings and roads separately using different imagery. I have attached an extract of the town Miragoâne from OSM. It took me nearly 6 hours to try and clean up this conglomeration. 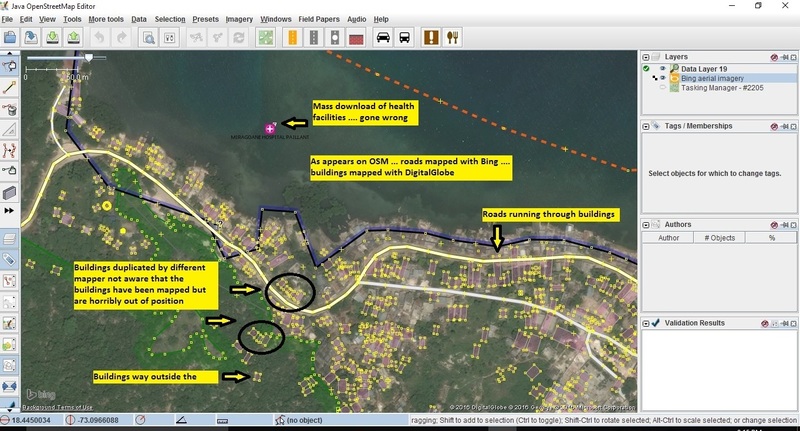 The roads, coastline and residential area were mapped using Bing prior to the disaster, the buildings were added using DigitalGlobe and then more roads were added using Bing again. While mapping the roads one mapper, not realising that some buildings along the road had already been mapped but were offset by a wide margin, mapped those buildings again. We al;so have a mass download of health facilities that ends up with a hospital way out in the sea. Conglomeration! .....An accumulation of miscellaneous things .... definitely not a map showing everything in relation to each other. I do not believe this is the end result we are all hoping for but some of this was validated as buildings all being fine.